The new year has begun with a tragic start for one Los Angeles family. A 30-year-old Orange man caused a four-vehicle wreck on the 22 Freeway in Garden Grove, leading to the deaths of a young girl and her mother. Police suspected the man was driving under the influence of alcohol at the time of the crash. Continue reading for details about the accident and traffic fatalities during the holidays, and contact a skilled California auto accident attorney with any questions about possible personal injury claims. An Orange man had just celebrated his 30th birthday on New Year’s Eve this holiday season. He was speeding westbound in the carpool lane on the 22 Freeway in his BMW around midnight, New Year’s Day, when he crashed into the back of a Lexus. The crash occurred just east of Valley View Street. The Lexus hit the center divider. The BMW continued to hit the back of a Ford 150 truck, causing the truck to flip. The flipped Ford continued skidding across lanes and was then hit by a Mazda sedan, which also slammed into the center divider. Most of the drivers involved were not seriously hurt. However, the driver and passenger in the Ford 150, a 33-year-old woman and her 9-year-old daughter, were killed in the crash. Miraculously, the woman’s 7-year-old son was in the back seat of the truck and made it out of the accident unharmed. At the time of the accident, police arrested the driver of the BMW on suspicion of driving while intoxicated. Police stated that upon his arrest he broke the window of a police cruiser while being wrestled to the ground by officers. The man was released a few days later without charges based on a lack of evidence. Officials say the investigation is ongoing, and it is possible that charges will come later. The tragic Garden Grove accident is one of dozens that occurred across California over the New Year’s holiday. 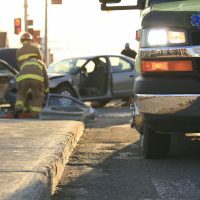 The California Highway Patrol reports that 36 people were killed in traffic accidents between December 28 and January 2, up from 23 deaths last year. The deaths included 32 motorists and four pedestrians. Officers arrested 1,140 drivers on suspicion of driving under the influence, compared to last year’s 936 arrests. The CHP noted that the numbers may be up in part because New Year’s Day fell on a Tuesday this year, extending the holiday by a day. If you have been hurt in an Antelope Valley auto accident, talk to a seasoned and dedicated personal injury attorney about pursuing a claim for damages by calling the Kistler Law Firm in Palmdale at 661-206-6990.